Hi loves! I just got back from what may be the best trip of my life. I spent a total of six weeks in South East Asia, a first for me. After shopping winter destinations, I made up my mind on Indonesia, Vietnam and Thailand. I have so many great memories and stories to tell that this article kind of felt overwhelming to compose. I decided to tell it as it was, a journey with different chapters in each destination. I landed in Bali on February 2nd, two days after leaving Montreal. The journey was long and included a stop in Hong Kong for one night but it felt fine. I've come to realize that travelling towards Asia is easy on my body, much more than the red eyes to Europe! I booked two nights in a beautiful boutique hotel minutes away from the Denpasar airport to work on my jetlag and get an initial vibe of Indonesia. Staying in Kuta was great to get me used to the constant taxi honking and learning to cross the streets where lights are a novelty! Staying in Kuta also made it easy for me to visit Seminyak, an area a little bit more hip especially for shopping and delicious food like at Sisterfields. I'm glad I took a few days in Kuta on my arrival and I can easily see myself doing that each time I land in Denpasar. It helped me start the trip with a nice little vacation before I got back to my remote work schedule. My ride from Denpasar airport to Ubud was beautiful. I had no idea what to expect of Ubud. 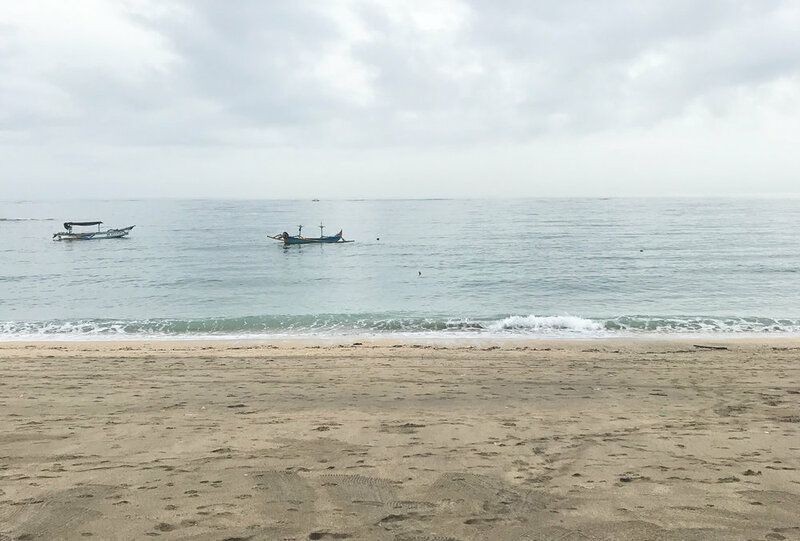 As I got closer to this area of Bali, I had the pleasure to take in new sights and feel really special about choosing to come here. I began two beautiful weeks of self-introspection. It wasn't the plan at first. I was meeting up with Hacker Paradise, a community of digital nomads so I expected to be spending time with lots of new people. The timing felt off with me arriving for the last two weeks of the program so I ended up taking a lot of time to myself. It was the best thing that could happen as it pushed me to meditate more than planned and visit places while trying new things on the daily! WAMM became my work base on mornings. I couldn't stop ordering their banana bread and avocado toasts. The music was also so good that I had Shazam on hand almost every visit. When work became less busy, I kept going for the food and started learning calligraphy. I was able to visit and experience special places like Tirta Empul, Campuhan Ridge Walk & the Tegallalang Rice Terrace. There was so much beauty all around me and especially within the locals. I started eating primarily vegan without even trying as both small family warungs & hip restaurants served the best food and with so much love. This photo is from Sage and I couldn't get over the beautiful window peeking into nature. 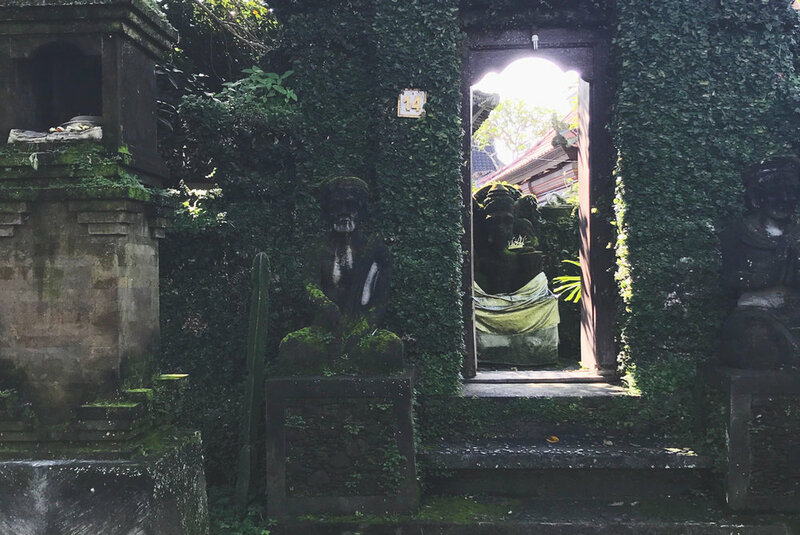 I took daily walks to Ubud's centre which was wild but in a good way. I loved getting lost in the small streets and walking from one end to another. 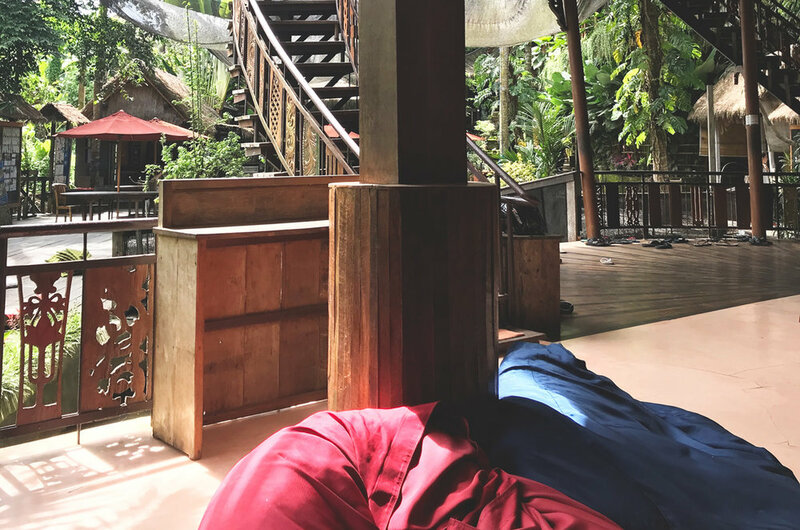 It became a habit to get a Balinese massage when I had a few hours to spare in the centre and Jaens Spa was my absolute favourite. To this day, this type of massage has been the most helpful on my body. My daily walks gave me the chance to see SO MANY monkeys and I didn't even need to enter Monkey Forest. It's so funny how it's such a normal thing in my life now but it took 32 years for this to happen! And finally, there was this place: The Yoga Barn. Probably like you, I rolled my eyes when I saw the name and even more the first time I visited. When I travel, I need to be surrounded by locals and let me tell you that this place, other than the staff, was white AF. BUT!!!! Because there is a but. The space and the quality of the classes were what changed my mind and made me go back again and again. Just to be clear, I went to this place but did not complete one single yoga class. Instead, I experimented with different types of meditation including breathing meditation, sound healing & crystal bowls. All I can say is wow. I learned so much about myself during those classes. I also felt so much in my body that I didn't let myself feel before. 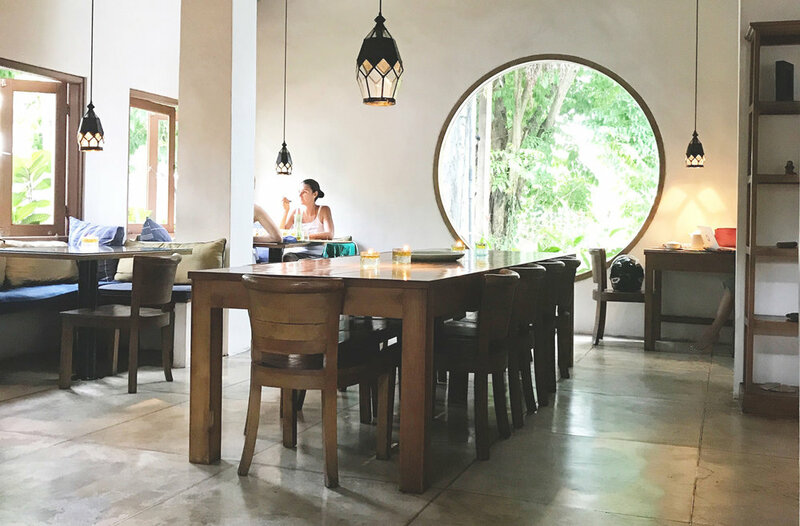 It's only after leaving Ubud and seeking a centre that could offer as much variety in my future destinations & back home that I realized that no other place was the same. So I kept my member's card to put more credits on my return! I had no expectations for Canggu other than being near the beach and seeing more hipsters all around. What I didn't plan for was maybe the perfect travel week of my life! As soon as I dropped my bags in my room, some ex-Hacker Paradise people messaged me and invited me to join them for evening drinks & food at La Brisa, a beach club with a view on Echo Beach. I could have easily taken it slow at the hotel but I had a good feeling about them and it ended up being so fun & chill. From that evening, up until the last day of my stay in Canggu, I was surrounded by a variety of amazing friends. Some of them I just met & clicked with while others I knew already. For a week, I completely forgot I was an introvert and it felt amazing to just be me. And that version of me decided to have some fun! I love walking when I travel and it made sense in Ubud & Kuta. Once I settled in Canggu, I realized that the summer weather and rice fields made the walks a bit harsh on me on top of making me sweaty! I noticed that a lot of travellers drove in this area and it felt safer. Still, I didn't want to become a danger to others on the road by jumping on a scooter without any knowledge. I did my research and found Musli on Facebook. For less than $20, I was able to learn everything that I needed in a safe place and then drive around with Musli on the back of my scooter. I rented a scooter for 24 hours after that and rode around on two occasions. I loved it! It was so much fun and I did get up a few times, even if it was to jump right in the water a second later. Sunny gave me so many tips I can use in the future which definitely makes me more comfortable to battle waves when going in the water. Canggu is definitely a dream location to learn surfing as I never felt unsafe in the water even if a few waves got me bad. To keep up with my week of "first times", I also joined a few friends for yoga from day one. I started with a class of Hatha yoga which reminded me why I didn't really like yoga. It felt long at times and the teacher made me feel awkward. Keeping my mind open, I went back to the same hotel to try Yin with another teacher and that's when everything changed. I finally found a practice of yoga that made sense to my head & body! I love the mix of meditation and deep stretching Yin offers. After that, I went for two more Yin classes at another centre called The Practice, probably the closest to what The Yoga Barn offered. The last class I booked was on my last evening in Canggu and two friends joined me. We completed a class of two hours with live music from Cellomano and the sound of the rain outside. It felt so beautiful from beginning to end and I was so happy to share this moment with two amazing women. What a way to end a perfect week. I'll be straight with you: once I dropped my bags in my new hotel room in Vietnam, I cried. Never in my life have I cried for leaving a place before and it felt the same as a breakup. Bali was so beautiful to me that I wasn't ready to leave and if I hadn't prepaid the next two weeks in Da Nang with Hacker Paradise, I would have stayed behind. The next day, after meeting everyone, I decided to stop being dramatic and make the most out of this trip. I was in Vietnam after all and steps away from a beach! After eating pho with the group, a friend proposed to drive us to Ban Co Peak on his scooter. This was just the first of many beautiful mountains & caves I was able to visit in the area. 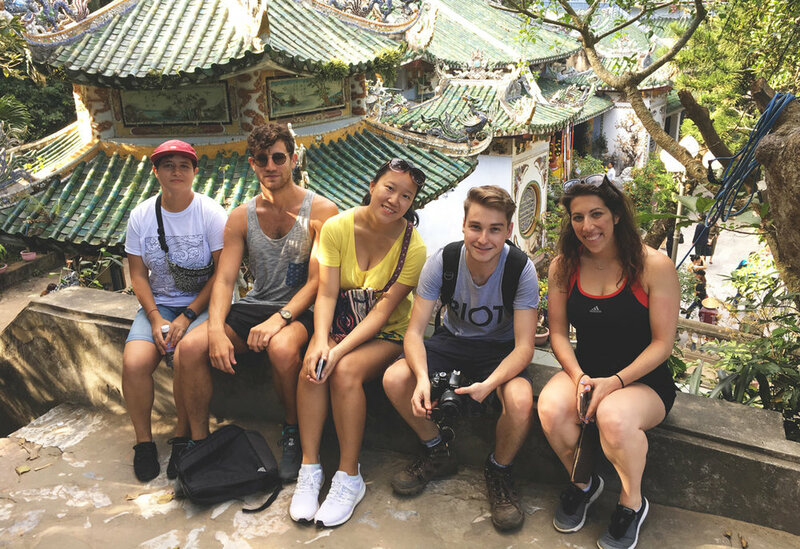 Hoi An was just 30 minutes away from Da Nang and it became a regular day trip for most of us. 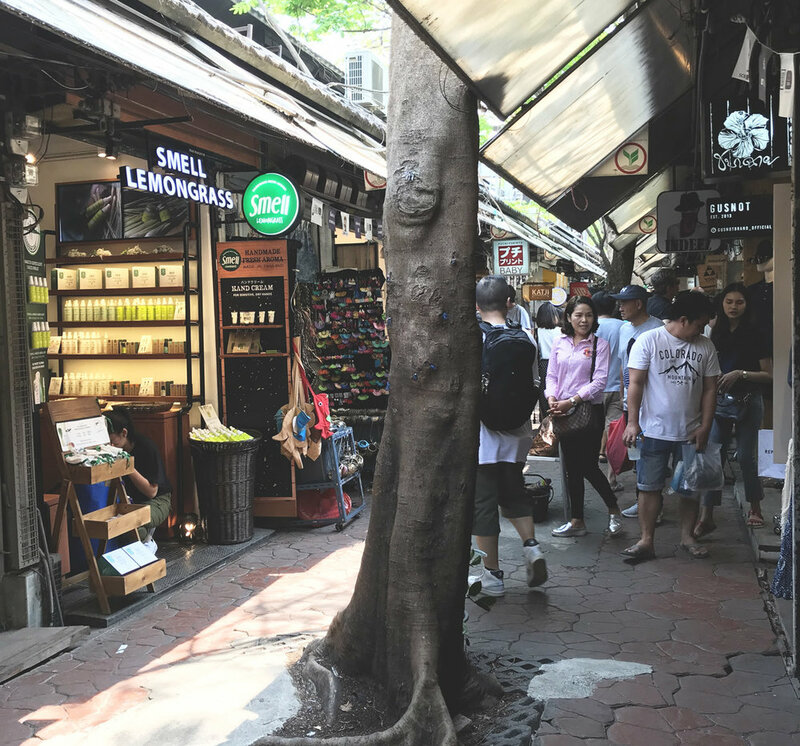 I loved spending time in this city, especially to try as much street food as possible! The part that I appreciate the most of my stay in Da Nang is the people I got to meet through HP. Everyone was super nice and I would meet up anywhere in the world with any of them again. I treated myself to what may be the fanciest hotel room of my life at Intercontinental. It had everything to make me happy: a crazy breakfast buffet with Asian food from every country, a high tech gym and a room with a direct view of a lake. I also booked a day trip on a boat to see Halong Bay. It wasn't perfect as any touristy activity but the sights made it all worth it. 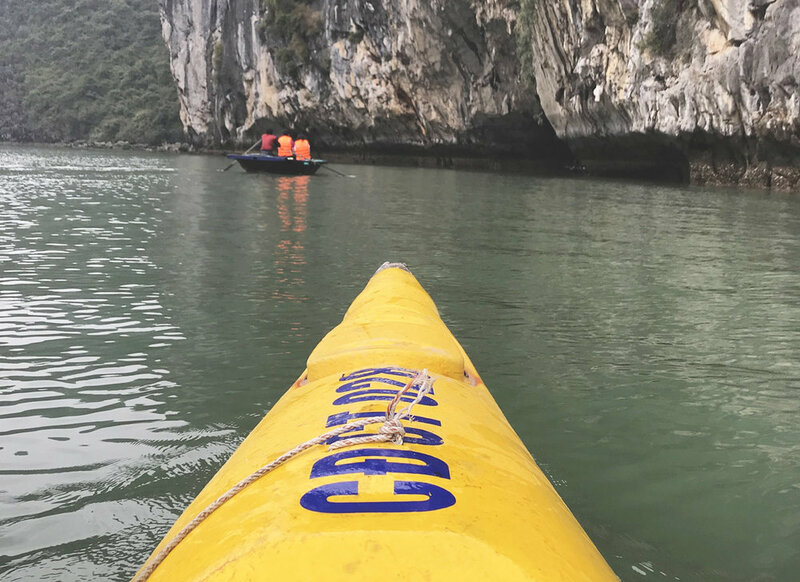 The day tour included kayaking which felt super peaceful! My favourite part of my trip to Hanoi was the weekend night market that I got to visit on both nights. I had the best food including grilled meat, banh mi & rice sticks! I was so excited to visit Bangkok! If I had more time, I would have planned more stops within Thailand but since I only had five days, it felt like the right city for me. I booked a pod at The Cube Hostel which was perfect for my needs. My first full day in the city was on a Sunday and it ended up being the busiest since a lot of things only happen on weekends! My first stop, after coffee obviously, was at Chatuchak Market. I wasn't expecting much of it as I had done my share of markets in previous locations. Bangkok is on a different level though! The quality and branding of the shops were mindblowing! I had such a great time walking through the small alleys. After a few hours, I jumped on a scooter ride back to my hostel to get picked up by Where Sidewalks End. WSE is a travel company that prioritizes positive impact tourism by caring about the locals and how travellers may affect them and their environment. I discovered them while I was in Bali and got the crazy idea of getting a tattoo. It all started in Montreal once I learned about stick & poke tattoos and how much more natural the process felt to me. My interest grew while I was travelling which lead me to this company that offered a meaningful experience by getting a Sak Yant from an Ajarn [probably a few words you do not understand which is why I invite you to head to their website to learn more about it]. My experience was profound and I felt safe from beginning to end. My guide was Valentino who is half Thai and half Italian. He moved back to Thailand years ago and I really enjoyed discussing his view on Bangkok and also the experience I was about to begin. I wanted to make sure it wasn't something that could be seen badly by locals. A lot of people do go to Wat Bang Phra to get a Sak Yant for just a few dollars and they take time away from the locals who actually contribute and take care of this temple. Just for that, the price of the experience made sense with WSE, so that everything is fair to everyone. Once we got to Ajarn Neng' studio, I had to complete a prayer and offering before sitting down with him and discussing my current life and what I was hoping to get from my tattoo. Valentino listened carefully and translated the conversation between the two of us. This whole part felt very emotional for me. After agreeing to where and what would go on my back, I got in position and the poking started. It was painful at times and I can't compare it to much as I never got tattooed before but I braced myself for a long session and was very surprised that it was over just fifteen minutes later! Ajarn Neng proceeded to the incantation and then I was able to get changed and go on with my day. After, Valentino checked if I was hungry and what type of food I'd like. He took me to a small restaurant where I had the best duck noodle soup from the cutest lady. From there, he called me a cab to get back to my hostel and we said goodbye. It's been one month since I got my Sak Yant and I love it so much! It healed super quickly and flying back home a few days later was not an issue even if it took 36 hours total. I'm not posting a photo of it because this wasn't about a look but a personal experience that I gave to myself. I repeat the prayer Ajarn Neng gave me every day and will forever feel thankful for this exceptional experience I was able to live. You'd think it would be hard to enjoy myself after living something that special but then I discovered Bangkok' street food which has nothing to do with the rest of the world. I ate so many different things including pork sticks, mango sticky rice, noodle soups, pad thai & tried so many different juices! I'm getting hungry again just looking at this photo. This wraps it for my amazing trip to South East Asia. Is it obvious I'm going back next winter and for twice as long? Yeah? Yeah.